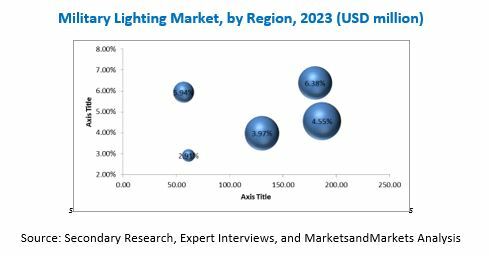 [183 pages Report] The military lighting market was valued at USD 482.5 million in 2017 and projected to reach USD 615.2 million by 2023, at a CAGR of 4.89% during the forecast period. The objectives of this study are to analyze the military lighting market, along with the provision of statistics. It also aims to define, describe, and forecast the military lighting market on the basis of the platform, application, technology, solution, and region. The year 2017 has been considered the base year for this study, whereas 2018 to 2023 is considered the forecast period. Military lighting ecosystem providers are Oxley Developments Company Ltd (UK), Astronics (US), STG Aerospace (UK), Orion Energy Systems, Inc. (US), Carmanah Technologies Corporation (Canada), Glamox International (Norway), OSRAM GmbH (Germany), Revolution Lighting Technologies, Inc. (US), Acuity Brands, Inc. (US), ATG Airports Limited (UK), Avlite Systems (Australia), ADB Safegate (Belgium). The military lighting market is projected to grow from an estimated USD 484.5 million in 2018 to USD 615.2 million by 2023, at a CAGR of 4.89% from 2018 to 2023. The major factors which are expected to act as major drivers are the increased awareness relating to energy saving characteristics of LED lights, focus of governments across the globe on the improvement of efficiency, reducing costs, and advancements in LED lighting technologies. These factors are expected to drive the growth of the military lighting market during the forecast period from 2018 to 2023. The military lighting market has been segmented based on platform, application, technology, solution, and region. Based on the platform, the military lighting market has been segmented into ground, airborne, and marine. The airborne segment is estimated to account for the largest share of the military lighting market in 2018 due to the growing demand for military aircraft and UAVs from emerging countries. In addition to this, various technological upgradation programs by developed countries, such as the US to include night-vision-compatibility in the lighting systems of their military aircraft are expected to drive this market. Based on technology, the LED segment is expected to lead the military lighting market. Growing awareness about various benefits of LED lights over traditional incandescent and fluorescent lights is leading to the higher adoption of LED lights in military services. Based on solution, the services segment of the military lighting market is projected to witness the higher growth during the forecast period. Since a majority of the military applications are expected to be required to retrofit LED lights in their systems, a significant demand for retrofitting services is expected in the industry. Also, since the life time of LED lights is around 5 years, continuous maintenance services for these lights will be required. The military lighting market has been studied for North America, Europe, Asia Pacific, Middle East, and Rest of the World (RoW). The North America region is expected to lead the military lighting market in 2018; North America is expected to be a major military lighting market due to the high demand for retrofitting LED lights in present military applications and the inclusion of LED lights in new military systems. Products offered by various companies operating in the military lighting market have been listed in the report. The recent developments section of the report provides information on the strategies adopted by various companies between November 2013 and October 2018 to strengthen their positions in the military lighting market. 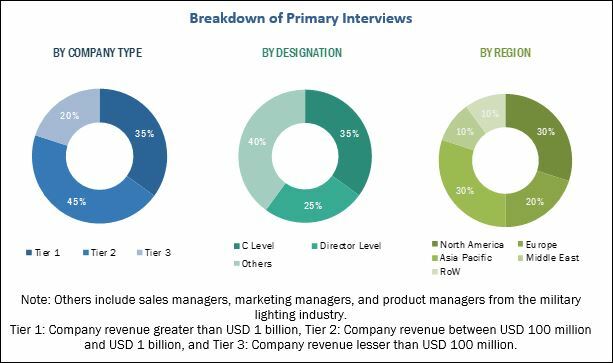 Major players in the military lighting market are Oxley Developments Company Ltd (UK), Astronics (US), STG Aerospace (UK), Orion Energy Systems, Inc. (US), Carmanah Technologies Corporation (Canada), Glamox International (Norway), OSRAM GmbH (Germany), Revolution Lighting Technologies, Inc. (US), Acuity Brands, Inc. (US), ATG Airports Limited (UK), Avlite Systems (Australia), ADB Safegate (Belgium). These companies have significant geographic reach and distribution channels. 12.8 Soderberg Manufacturing Company Inc.
12.16 Revolution Lighting Technologies, Inc.
12.17 Acuity Brands Lighting, Inc.